Latin American over-the-top video revenues will more than triple between 2015 and 2021, with this year to be “seminal” for the market, according to new research. 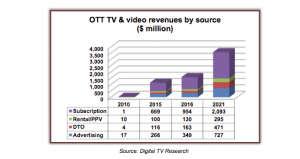 The Digital TV Research report tips OTT TV and video revenues in Latin America to reach US$3.59 billion in 2021 – an increase from US$1.15 billion in 2015 and just US$32 million in 2010. Netflix launched in Latin America in September 2011 but “substantial SVOD competition” now comes from the likes of America Movil’s Claro Video, Telefonica’s Movistar Play, HBO Go, Televisa’s Blim and Millicom’s Tigo Play, according to the report. Subscription video-on-demand is predicted to remain the region’s largest OTT revenue source, contributing US$2.09 billion by 2021, some 58% of the total – up from “next to nothing in 2010”. Digital TV Research predicted that there will be 31.9 million SVOD subscribers in Latin America by 2021, compared to 11.2 million at the end of 2015 and only 12,000 in 2010. 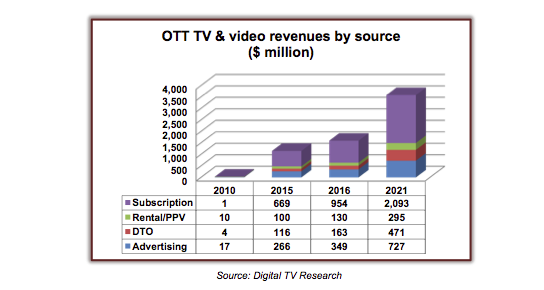 While the move towards SVOD services will “stifle the pay-per-view or rental market”, the research predicts that the OTT rental and pay-per-view revenues will still “expand rapidly”, climbing from US$100 million in 2015 to US$295 million 2021. Advertising on OTT sites are also tipped to bring in US$727 million by 2021 – up from US$266 million in 2015. However, free-to-air catch-up viewing is “unlikely to be as prevalent” as is regions such as Europe.